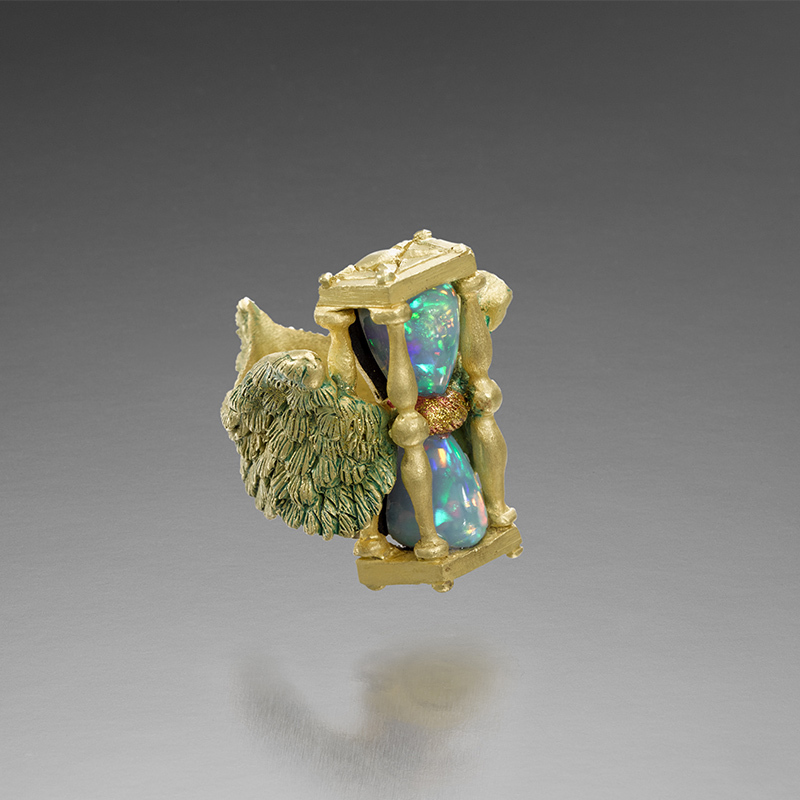 The ring is 18k gold with patination and silver with an encaged hour glass comprised of two superb Ethiopian opals. Coates’ meticulous craftsmanship is evident in the beautifully carved and patinated balustrades and wings. From every view at every angle, the ring is a masterful sculpture in miniature, the back as elaborate as the front. A work of art that is also a joy to wear, the ring is a size 7 1/2 and cannot be sized. Described by Harper’s & Queen as “Britain’s LEONARDO,” Kevin Coates has been commissioned to make work for the permanent collection of the Victoria and Albert Museum in London, as well as His Royal Highness the Prince of Wales and Ten Downing Street. Read more about Kevin Coates. Unalterable US size 7 1/2. Due to the settings of the stones and the sculptural nature of this ring, it is unable to be sized. Please contact us if you have questions.